CHARTER DAY DINNER 2017 - A NIGHT TO REMEMBER! Almost one hundred members and guests of the Queen's Graduates' Association (QGA) gathered in the splendour of the University’s Great Hall for the annual Charter Day Dinner on Friday 24 November – and it certainly was a night to remember! Charter Day marks the establishment of Queen’s College Belfast in 1845 and the creation of Queen’s as an independent university in 1908. 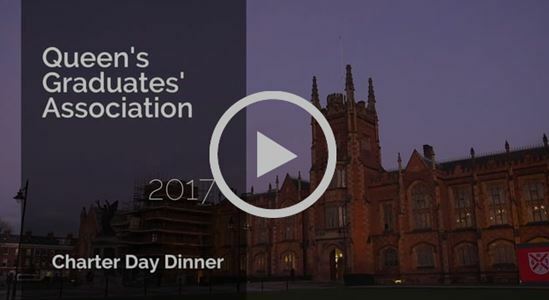 The black tie Charter Day Dinner is organised by the QGA in conjunction with the Development and Alumni Relations Office at Queen’s each year. Proceedings got underway at a lively pre-dinner drinks reception in the Canada Room, where members and guests were warmly entertained by the Ionian String Quartet. Before dinner was served in the wonderful surroundings of the Great Hall Association President Fergal McFerran welcomed everyone to the annual celebration before introducing the Acting Vice-Chancellor of the University, Professor James McElnay. Professor McElnay updated guests on the progress to find a new Vice-Chancellor, following the sad passing of Professor Patrick Johnston in June. He also outlined the latest news from around the campus and the achievements of the University in the last year. He also singled out the achievements of the First Trust Bank Queen’s Graduate of the Year Johann Muldoon, and the evening’s other awardee, Alumni Volunteer of the Year, Sean Hunt. Highlighting the important work carried out by the QGA, he concluded his remarks with the formal toast to the Association. After dinner, Ian Moore – Head of Alumni Relations and Annual Giving – delivered the citation for the award of Alumni Volunteer of the Year. This year’s recipient, Sean Hunt, had been singled out for his work with Queen’s City Leaders and the City Scholarship programme. The evening continued with the presentation of the First Trust Bank Queen's Graduate of the Year Award, to the multi award-winning local architect Johann Muldoon and an interview with her by BBC journalist and Queen’s alumnus Mark Simpson. Following the presentation of her award, Johann joined Mark Simpson on stage for an engrossing Q&S interview which covered her early childhood, her time at Queen’s and her progress and success in the architecture profession, local and internationally. 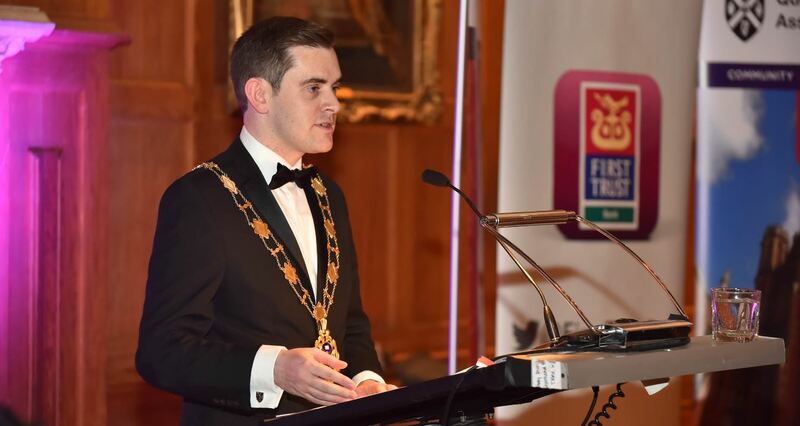 QGA President Fergal McFerran responded to the Toast to the Association outlining the valuable networking opportunities which the QGA afforded graduates and on the Association’s busy events programme throughout the year. Commenting on the evening, Fergal said: “Charter Day is a celebration of everything that is great about Queen’s University and particularly, the achievements of some of our fantastic graduates. Visit the QGA Facebook page for a selection of photos from this year’s Charter Day Dinner. For further information on the QGA or membership of other Queen’s alumni associations, please contact Alumni Officer Natasha Sharma, telephone +44 (0)28 9097 3135.